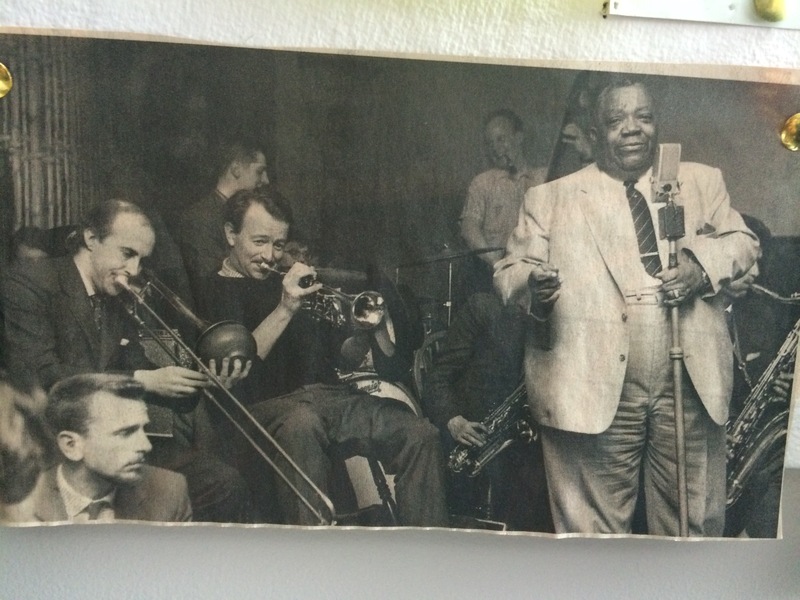 Humphrey Lyttleton and Jimmy Rushing (among others) doing their thing. This was a picture that I culled from the Financial Times a while ago that was partly responsible for my taking up the trumpet late in life (sorry Denize, I know it’s loud). Rushing, if you’re not familiar with his work, was in his pomp in the 50s when he recorded a version of his biggest hit – Mr. 5 by 5 (so called because he was said to be 5′ tall and 5′ wide) – with Lyttleton’s band. So, at the end of my PhD, aside from trying to find an academic job and writing up articles/books, I needed a project. The manager’s vacancy at Perfidious Albion had been filled (it’s currently open again if anyone wants to apply). Music was on my mind. I’d seen Rusbridger’s exercise in egoma … errr, interesting project of learning the piano heavily publicised by the middle class media and the thought of trying out an instrument seemed a good one. But not the piano, I like it too much to spoil it. My son was/is learning trombone and I had the sound of brass in my head. And I wanted something portable and with an adaptable sound. This picture struck my eyes and a plan to play the trumpet was born. I am fortunate enough to live close to a top class young trumpeter (‘James The Trumpet’** to distinguish him from my son) who was a student at the Guildhall when I first started but is now doing a Masters at the Royal Academy of Music in Marylebone. I’ve been an avid concertgoer for a long time but it wasn’t till I met James that I thought to go to the RAM for a bit of lunchtime music (I haven’t managed to see him there yet, to my shame) and its different atmosphere to my usual haunts (the Wigmore and St. James’s Piccadilly) put me in mind to do a little round up of what’s on offer in the West End at lunchtime for a time-rich, cash-poor music fan. *** Because each (and I’m using SJP as an exemplar of the free music on offer in lots of churches in London at lunchtimes – another favourite is St Bride’s, Fleet Street) has a very distinct profile both of performers and market. But my main concern is to publicise the fact that these things happen at all. When I go to these venues, from the library or from home, I invariably have to walk along at least one portion of three of the busiest shopping streets in the country – Marylebone High Street, Piccadilly and Oxford Street. One of the attractions of going to a lunchtime concert is that you step from the noisy sea of humanity that is the West End into places of absolute calm and thoughtfulness. And I don’t intend to give the impression that going to a lunchtime recital is a relaxing experience in some shallow cheesy listening classics way. These concerts are for thinking; for engaging with the relationship between performer, sound and architecture. And above all, if it’s going well, a concert gives a satisfying rush of emotion, of diverse emotions over the course of an hour long performance. In many cases it’s for donations only, or for the Wigmore (where the performers they have on Mondays are extraordinarily good) for 13 quid. What troubles me though is that even for an established venue like the Wigmore it isn’t difficult to get tickets. The church and college performances are sometimes moderately, sometimes sparsely, attended. There are thousands upon thousands of people shopping, scoffing sandwiches, boozing, idling within minutes of the doors of these venues who would surely enjoy a more cerebral, or more visceral lunch. I think one of the off-putting things is that if you haven’t been you don’t know what to expect. There’s very little commentary on what happens in these places on the internet, except among those already in the know, and hard as the publicity departments of the Wigmore and the Colleges work it’s obviously very hard for them to compete with the tidal wave of garbage on Twitter. And I remember that when I worked in the City (nearly twenty years ago) I used to walk past a sign for concerts quite frequently (usually at St. Mary-at-Hill, sometimes at the Pepys church) without being tempted in because somehow I thought (as a Sarfend/pit village raised geezer) that they weren’t for me. Which is the kind of blinkered nonsense it took me a long time to get over. So in a spirit of encouraging fellow chip on the shoulder sufferers, and I hope with not too much disrespect to the institutions themselves, I offer this brief guide to two venues I’ve been to a lot and one venue that was new to me with my thoughts on who goes there, what’s on offer and how to get the best out of the experience. 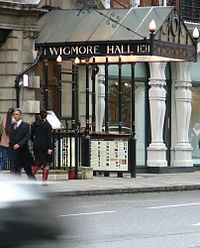 The Wigmore Hall is the daddy of all chamber music venues in London. It has a fascinating history, which I won’t go into here because that’s not what this post is for (but do look it up). Just walking through the door you can feel a sense of history. This oozes out of the grand architecture and is backed up by portraits of the multitudes of performers who have played there over more than a century of music-making. The crowd is similarly historic and one could be forgiven that some of them were there for the opening night way back before World War 1 (the war was significant for the Wigmore, it had previously been known as the Bechstein). These venerable patrons mix with obvious high-brows and a range of eccentrics who put the regular Joes and Josephines (among whom I count myself, I’m often among the youngest there) in quite a small minority. So architecture and punters can combine to make up a pretty intimidating atmosphere for the lunchtime neophyte. Fear not, this is one of the most knowledgable music crowds you’ll ever be among and if you dare to break the ice with someone at the (excellent) bar before or after you’ll generally be very welcome. The Wigmore costs (13 pounds on Monday) and I’m aware this can be a barrier to entry for some but it’s cheaper for students and you get an excellent small programme included. The bonus of the Wigmore series is that since it’s featured on R3’s lunchtime slot you can listen live and then listen again at home via their website or on Sunday when it’s usually repeated. My own ideal routine goes an hour in the library, sweets (overpriced but cough candy is a bit of a madeleine for me so worth it) from Mrs Kibble’s in St Christopher Place, a cheeky little pre-action Viognier in the bar with the crossword (the staggering distance pubs are not good) and then get there just in time to an end seat if possible. The regulars do not like being made to stand up once they’re sitting and the seats are quite tight. The repertoire is generally solidly Baroque/Classical/Romantic big beasts, with the odd bit of twentieth century/contemporary thrown in from time to time, meaning that if anything too atonal isn’t your bag there shouldn’t be too much to frighten you here. The performers are uniformly outstanding (and I mean world class), whether established artists or members of the BBC’s New Generations programme and the Hall’s acoustic is reputed to be one of the best in Europe. The first time I went there I thought there was something wrong because I could hear the music too clearly. My brain had to adjust to the crystalline sound in order to make it appear normal to me. That’s a feeling that still returns if I haven’t been there for a while and have been going to mudpits (see StJP below). So what I’m saying is one shouldn’t count oneself a Londoner without at least one visit to this, the best music venue in London bar none. St JP is worth a visit even if not for the music and I think the first time I heard some music there was because I happened to be visiting to do some research for a walk when a concert was about to start. 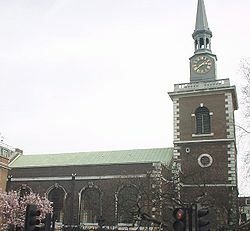 The building is by Wren, with much restoration following bomb damage in World War II, and being at the heart of St James’s has oodles of connections with the rich and famous through history. Its position on Piccadilly means that the crowd it gets is a mixed bunch. A lot of the un-idle retired (as always at these things), with a smattering of youngsters (especially if the performer is a music student), some local office workers and a dollop of more or less confused tourists, depending on whether they knew in advance of their visit to the church that there was a concert on. This means that for the newcomer, by contrast to the Wigmore, you will not be alone in being new. Of course another upside at St. James’s, if you’re not sure you’re up for the lunchtime music scene, is that the concerts are free (although if you’ve enjoyed the gig you’d be an ingrate beast not to make a donation on the way out) and performers are not concerned if you leave in between pieces (although NOT in between movements) as there will be some in the crowd who don’t have the full hour off for lunch and necessarily have to leave. Those on a budget can get cheap eats before/after out the back of the church where there’s a street food stall, with park benches in the Square for scoffing space. And naturally there’s plenty of sandwich bars and restos in St. James’s and environs. Booze hounds might want to check out the Red Lion for its Victorian interior though the crowd in there can be a bit brayingly hedgey. The repertoire at StJP is similar to the Wigmore – mostly killer no filler. Occasionally there’ll be a new piece (sometimes with the composer in attendance) as this venue is one where students often come to get some concert practice and they’re more adventurous. So probably a bit more variety than at the Wigmore. But be warned – there are three potential downsides. The acoustic is not the best and it pays to sit near the front. If you want to do this you’ll need to get there early as the front rows often fill up quite quickly. There is also a lot of construction in St. James’s. Those builders don’t stop for anyone, not even Schubert. Also, if you’re there for the duration try and judge that the person in your row is there for the music and not liable to get up halfway through/start scrunching their sweet packet/be jabbing their phone. The pews are uncompromisingly pew-ish too, be prepared for a bit of fidgeting to get a comfortable lie. Thirdly, standards can vary too! The students are generally excellent (to this untrained ear) but there have been occasions when I’ve been in attendance at performances that were excruciatingly bad. I mean not just bad but downright offensively amateurish car crashes of recital. You might think, ‘I’m up for a bit of car crash classical.’ You are wrong. I was left only with the anguish. But it isn’t always like that! Mostly it’s good times in St James’s, well worth the trip if you’re in town and want to rest your feet. The RAM, as mentioned above, was new to me and it was thanks to James the Trumpet that I took a look in there last week for a concert of a Notturno by Haydn and Mozart’s Gran Partita in the Duke’s Hall (I think there’s another hall for chamber works). The Duke’s Hall is smack on the Marylebone Road but you wouldn’t notice once you’re inside the building. All is peace. Well, bustly peace. There are students everywhere and this gives a buzzy atmosphere and makes for a younger crowd than at the other venues. As the concert I attended it was half old buggers like me and half students. Again, this concert was free and unlike StJP there’s no expectation of a donation – the point of the exercise is for the students to gain concert experience so you can enjoy it for nowt guilt-free. If you’re skint you can lunch in the canteen downstairs. If you’re well-heeled Marylebone High Street is across the road. The hall is purpose built so the sound is great and there’s all sorts of portraits of musicians around the walls to keep your eyes occupied, as well of course as the museum next door (which I may talk about another time). The performance I saw was introduced and conducted by Trevor Pinnock (though he denied that he needed to conduct these pieces) and was phenomenally good. I knew neither piece and to come to something fresh, performed by outstanding young musicians with a top-rank musician in charge was a privilege. Though if you only have an hour for lunch they weren’t concerned about that, I think the performance lasted about 70 minutes – though again there was no tutting at people ducking in or out between pieces. As it was my first go I haven’t got a handle on their repertoire yet but I’m assuming that of these three venues it will be the widest as the students learn the full range of serious music – classical, contemporary and jazz. Thursday they’re doing Shostakovich (I’m only just getting into him) Trios and since I’m working in the evening that day it might be the perfect break between library and job. If you’ve made it to the bottom of this page then I know you’re either a lunchtime concert-goer already or you’re thinking about giving it a go. Do so. Do something different that might improve your state of mind for the cost of an hour of your time. * Except of course he wouldn’t have been daft enough to use that term outside of describing someone who worked in a gallery. ** If you want his details for tuition you can contact me here. He is a gent. *** It also has a stonking museum that I’ll blog about anon. This entry was posted on May 13, 2015 at 9:22 am and is filed under Culture, Music. You can follow any responses to this entry through the RSS 2.0 feed. You can leave a response, or trackback from your own site.